I have had several people ask in various FB and forum posting about the strength of our clothespins. Because I am a teacher and love to experiment I put them to the test. I am just not the kind of person that can say something is great unless I have seen the proof. I have always been a terrible liar. 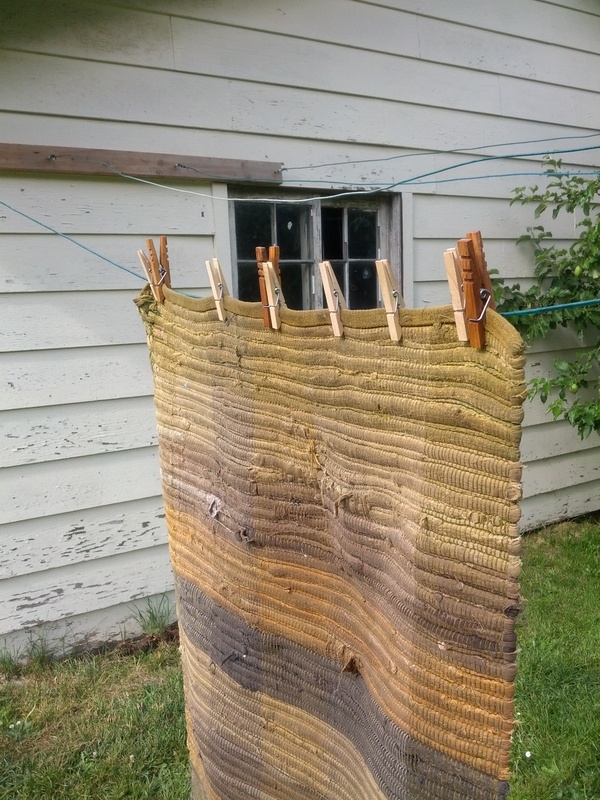 I knew from the sturdy, heavy duty feel of our clothespins they were going to do a much better job than the cheap, flimsy ones I bought from an unnamed big chain box- store. How did Kevin’s Quality Clothespins compare to the cheap import pins that I, and most people, have been using? 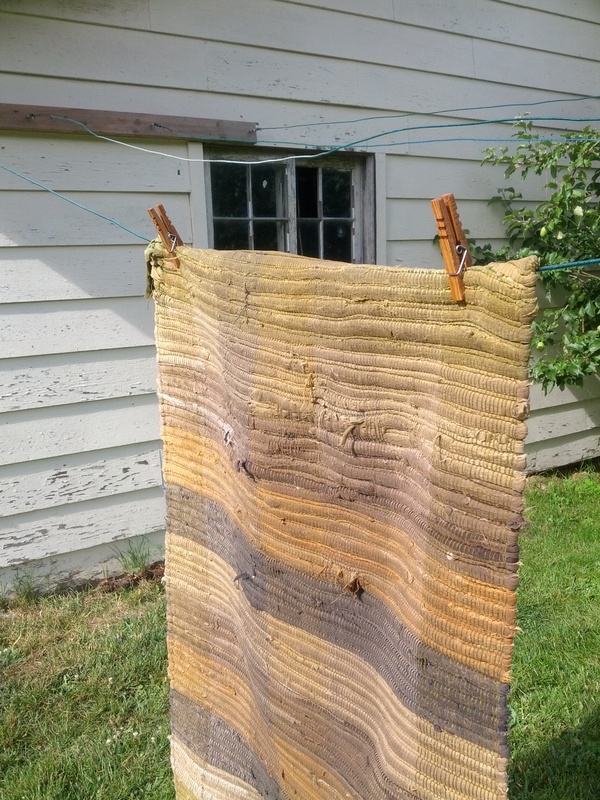 Then I hung it with Kevin’s Quality Clothespins (KQC pins) with about an inch folded over the line. Two of them held it nicely and stayed put when I shook the line. Why shake the line? Well, I have three young children and the hanging laundry is going to be touched… it is inevitable. 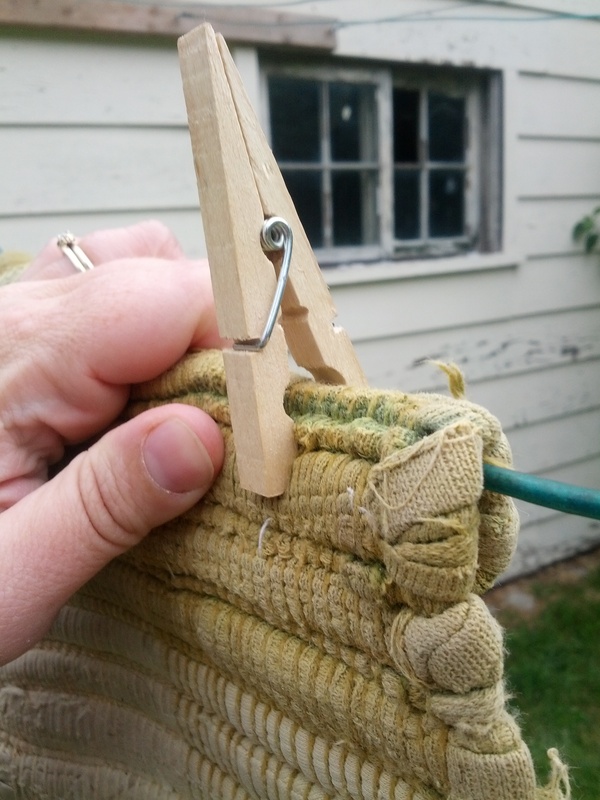 I then took my box-store clothespins and well… they wouldn’t open wide enough to fit over the edge of the rug to hang it on the line… sigh… See in the picture below, it almost made it but my rug is too thick. 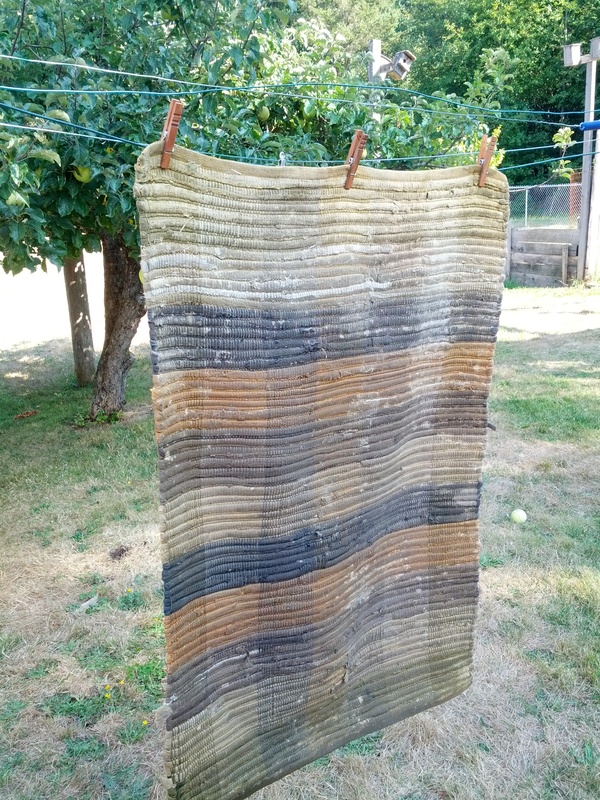 First, I decided to hang the rug with no fold over because I actually wanted to test compare the two types of clothespins. I started with Kevin’s Quality Clothespins and got it hung easily with 3. When I reduced it to two they popped off. I was actually pretty impressed three held because this rug is pretty heavy. Next, I went to hang the rug with the box-store pins and I couldn’t get the darn thing hung without the previously attached pins popping off! Grrrr! 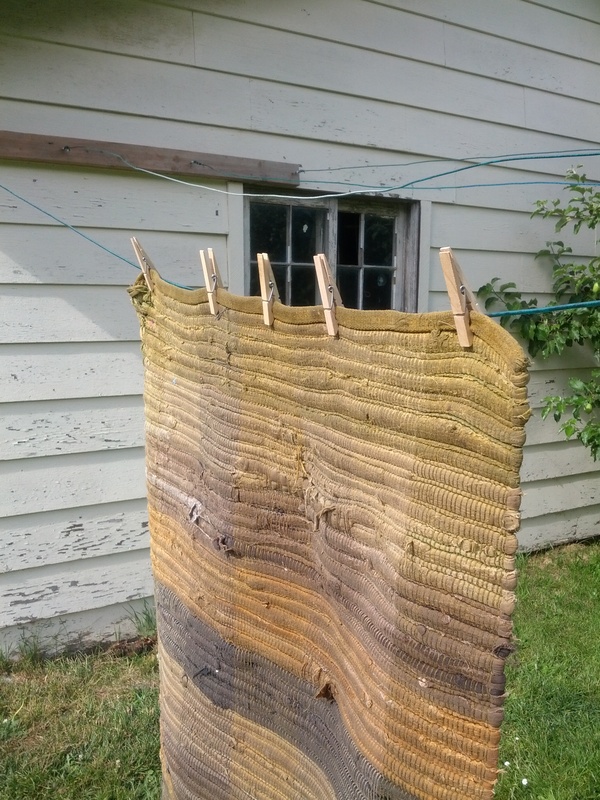 Okay, I didn’t let that stop me… I hung the rug with 3 of Quality Clothespins. Then I added 6 of the box-store clothespins among them. I then removed the Quality Cothespins and it finally stayed. Then one by one I pulled off the box-store clothes pins, counting slowly to 5 between removals. This is the last picture I could take before they flew off the line. I touched that middle pin, they all when flying crazy and my rug was in the grass. My kids were wondering why I squealed, laughing at me. I went to pick up the mess and found the pins half off their springs… hmmm…. do I bother putting them back together…? Nope probably not. If I give the Imported Box-store pins any credit it would be based on their entertainment value. When they all flew off the line I laughed and my kids thought it was funny to watch me try to dodge them. I redid the experiment several times so they got to enjoy the mayhem. I won’t burn the cheesy imported pins but they are being relegated to the kids play box for some momentary entertainment until they break… or until they leave them on the floor and I step on them with the legos one too many times. Of course you don’t have to take my word for it. Click the link below and see our comment section at the bottom to read reviews from our customers. Be your first customer. Love the clothes pins. You do amazing work. Can’t wait to see what you come up with in the future. …But will they work if you need to clothespin a particularly rambunctious 2-year-old boy to a clothes line… next experiment! Thank you! We are up and running now if you would like to purchase our factory seconds. Factory Firsts will be available in August. To see our purchasing page go to The Lady and the Carpenter Store Tab and follow the link to Kevin’s Quality Clothespins.